If you're in need of a last minute gift for a localista or Spokane sports fan, the Spokane Indians minor league baseball club has you covered. 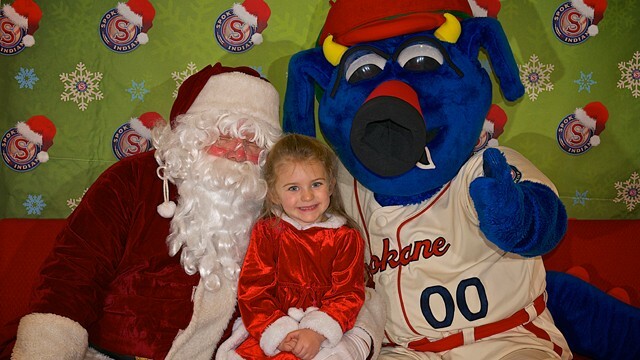 Today and Thursday, Santa himself will drop by the team's Avista Stadium to take pictures with visiting children (and grown-up children, too) from 4 pm to 6 pm. Also on hand will be OTTO the Mascot of the team, and Doris the Spokanasaurus. Visitors can dig into free candy canes and hot chocolate while they wait for their turn to sit in the jolly dude's lap and tell him their wishes. And an on-hand photographer will take shots and post to the team's FlickR account, where you can download them for free. While you're there, you can check out the team's store and get 20 percent off all your purchases at checkout, and you can even look ahead to the 2016 season with special deals on ticket packages. The Spokane Indians open the 2016 regular season on Friday, June 17th at Avista Stadium against the Vancouver Canadians. How much progress has the Spokane Police Department made on the DOJ recommendations?